Dubai, UAE, January 21, 2019: Janika Sprunger, the Swiss rider and her horse Bacardi VDL won the Emirates Airline Dubai Grand Prix, the biggest award in Dubai Show Jumping Championship. The Championship, which took place from 16-19 January 2019, is organized by Dubai Equestrian Club and hosted by Emirates Equestrian Centre in collaboration with the UAE Equestrian and Racing Federation (UAEERF) under the supervision of International Federation for Equestrian Sports (FEI). The competitions were attended by a number of equestrian clubs’ representatives, that are sponsoring the Championship, and a huge number of show jumping enthusiasts, who thoroughly enjoyed the competitive performances put on by world-class riders who came from 30 different countries. The final competition witnessed the best records from riders who were interested in qualifying for the Longines Jumping FEI World Cup™ Final that will be held in Sweden in April. At the end of the coronation ceremony, the president of the Championship presented award plaques to the entities that played a positive role during the events of the Championship and contributed to its success. The championship kicked off in parallel to CSI2* competitions in order to allow for the largest number of riders to participate. Hamad Al Shamsi, Show Manager, expressed his appreciation and gratitude to H.H. Mohammed bin Rashid Al Maktoum, Vice President and Prime Minister of the United Arab Emirates and Ruler of the emirate of Dubai and H.H. Sheikh Hamdan Bin Mohammed bin Rashid Al Maktoum for supporting all equestrian activities. He also extended his appreciation and gratitude to Mr. Saeed Humaid Al-Tayer for supporting the Emirates Equestrian Centre through Meydan Group, and enabling teamwork in all administrative and technical aspects, which constitute the most important factors in the Championship’s success. The participants shared their positive feedback about the equipment provided to them, the course and the stables that received all horses participating in the championship. Al Shamsi also thanked all of the committees working in the championship, as well as media and TV channels who covered all events, whether by writing about it or streaming it. The Grand Prix included two rounds, with jumps of height 160 cm, which is the highest limit in international jumping competitions. 31 riders participated in the first round, nine of which succeeded in qualifying to the next round. Four out of these nine riders rode with no faults, whilst the others got only one penalty point for passing the allocated time in the first round. Two riders completed the second round without faults in both rounds - Janika Sprunger, the Swiss rider and her horse Bacardi VDL came in first by completing the second round in 49.96 seconds, followed by the Italian rider, Paolo Paini and his horse Ottava Meraviglia di Ca' San G, who completed the round in 51.29 seconds. In the first round, Janika outrode Paolo in timing, which gave her an advantage over him in the second round. The German rider, Philipp Weishaupt, and his horse Che Fantastica came in third place as they finished the round in 47.85 seconds with four faults. The British rider, Georgia Tame, and her horse Z7 Caretina took the lead in the Longines Accumulator with the joker jump. The course of this competition was designed with ten obstacles placed at 145 cm high, except for the Joker, which was even higher. 32 riders participated in the competition, but only seven of them succeeded in gathering all 65 points. This competition is one of the most exciting competitions in the world of show jumping and requires a horse’s courage and rider’s skills to get through. Georgia and her horse excelled in this aspect and completed the course with the best time recorded of 49.88 seconds, setting her in first place. Ireland’s David Simpson and his horse Jenson, fiercely competed and completed the round in 49.97 seconds, granting them second place and in third, came the Thai rider, Janakabhorn Karunayadhaj and her horse Hoepala vh Daalhof, completing the round in 53.28 seconds. The Young Emirati rider, Abdul Rahman Ahmed Ameen, and his horse Newton Abbot came in second place in the Meydan Grand Prix CSI2*, sponsored by Meydan Group. The competition was held on the final day of Dubai Show Jumping Championship, where Abdul Rahman Ameen came in the second place after completing the jump-off round in 43.71 seconds. Sweden’s Charlotte McAuley completed the same round with her horse Valentino Tuiliere in 41.54 seconds, allowing her to clench first place and in third, came Sheikh Ali Abdulla Al Qasimi with his new horse, Itchy van het Lambroeck, recording a time of 47.35 seconds. 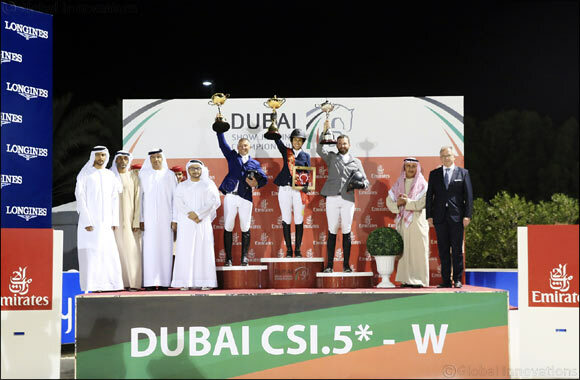 In the third day of the Championship, two CSI5*-W competitions were held; one of them being the Gulf News Cup. The competition was sponsored by Gulf News and the winners were crowned by Safiya Jomaa, Advertising Sales Manager at Gulf News. The competition consists of one round with a jump-off and its course was designed with 145 cm obstacles. 37 riders participated in the event, and those who scored the best timings in the first round qualified for the jump-off. Five of the 37 riders qualified, including the American rider, Alice Debany, and her horse Amareusa S, who completed the jump-off on her favorite course without any faults in 38.60 seconds, which resulted in her winning the Gulf News Cup. Debany is an experienced rider and also the coach of the jumping team in Emirates Equestrian Centre. Her horse, Amareusa S, is 14 years old and she has spent 10 of those years with Debany, during which they’ve achieved many great results, especially in Emirates Longines Show Jumping League, which has 140 cm obstacles. In second place came Germany’s Jörg Naeve and his horse HH Fleur, who completed the jump-off in 42.06 seconds, adding a new achievement to his previous one, when he won the opening of the CSI5*-W competition. The Danish rider Tina Lund and her horse Freestyle came in third, recording a time of 43.89 seconds. The Portuguese Rider, Luis Sabino Goncalves, and his horse Dominka van de Lucashoeve won the Azizi Developments Golden Cup, for which the total purse is 93,300 Euros. This competition includes 155 cm jumps, which is only five cm less than the jumps in the Grand Prixs of CSI3* International Jumping Competitions and beyond. 33 riders participated in the first round, 12 of which qualified to the next round without any faults. In the second round, the competition intensified between the finalists - the Portuguese rider, Luis Sabino Goncalves, completed his round in 44.33 seconds, while the Swedish rider, Linda Heed, and her horse Jarvis Van D Abelendreef, came in second with 44.54 seconds. In third place came the British Rider, William Funnell and his horse Billy Diamo, recording a time of 48.78 seconds.